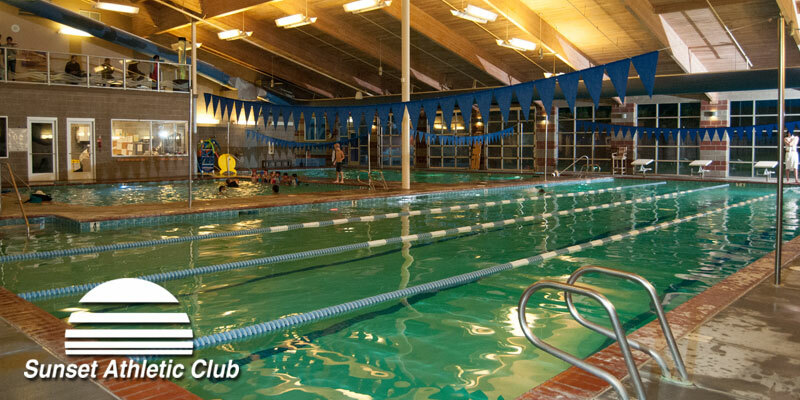 Our Indoor Aquatics Center provides a comfortable environment for water sports year-round. Our salt-water purification system keeps the water crystal clean with­out unpleasant chemical odors. The Center provides three indoor pools for swimming, therapy and exercise. Members enjoy the Center for group exercise classes, workshops, lessons and special aquatics events. Some activities have fees, while others are included with membership. Some programs also allow non-members to participate. In addition to our pools, we offer a co-ed steam room, sauna, large Jacuzzi and an outdoor splash and play area for added summertime fun! Our 4 lane Lap Pool is 25 yards long and includes two deep and two medium depth lanes. The 81° F. water temperature is perfect for energetic deep water fitness and lap swimming. Slightly warmer at 84° F., our second largest pool hosts group fitness classes, swimming lessons for all ages, and the favorite pool for family and open swim sessions. Our 91° F. Therapy pool hosts physical therapy and therapeutic training. Uniquely designed with stainless steel bars around the pool and down the center for optimum stretching and rehabilitation. Hosting a pool-party or want to learn scuba? Parties and water-activity classes take place in the Wet Classroom. View all the action in our three main pools from our second-story viewing deck! Also, enjoy the convenience of Family Changing Rooms. We offer MANY group fitness classes for members in our Aquatics Center. Classes are held at a wide variety of times and cover many fitness needs. Some examples include: Water Wake Up -Start your day building flexibility and endurance; H2O Cross-Training - Deep and shallow aerobics with fitness bells and resistance equipment; Aqua Barre - Get strong in this Pilates based water workout; Plus many other options for all fitness levels. We offer lessons for all ages. Classes usually run 30 minutes in length, and run on weekday afternoons or evenings, twice per week for four weeks. Members and non-members may attend, fees vary accordingly. Please contact SAC for a current schedule and to register for all lessons and programs. Children ages 3-15 years must complete a swim evaluation before they can register for any group swim lessons (or if it’s been more than six months since they have been in our group lessons). Evaluations are held on specific dates and times, please contact SAC for details. Please register for all lessons in person, phone-in registrations are not available. You are never to old to learn! 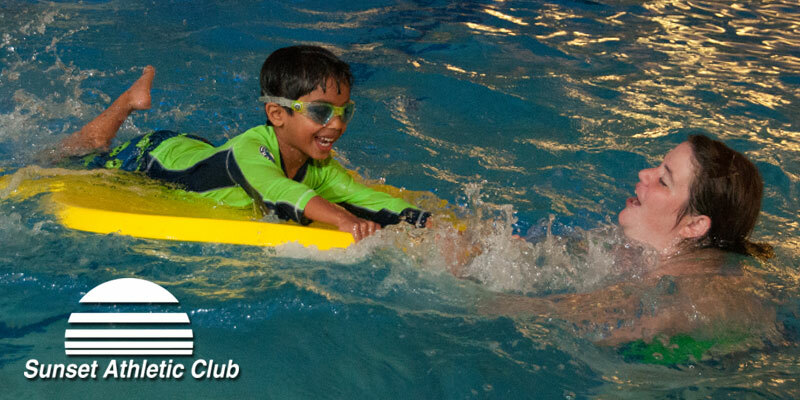 SAC offers swimming lesson for any adult age 16+. Whether you are a beginning swimmer, need to brush up your swimming skills, or want to learn a new stroke – or adult group swim lessons are for you! This swim program is ideal for those with limited swimming experience. Increase your comfort in the water, improve your swimming strokes and learn some life-saving skills. Our swim-readiness program, originally designed for children who are 3 years of age, now expanded to include 4-year-olds who are a bit hesitant in the water. 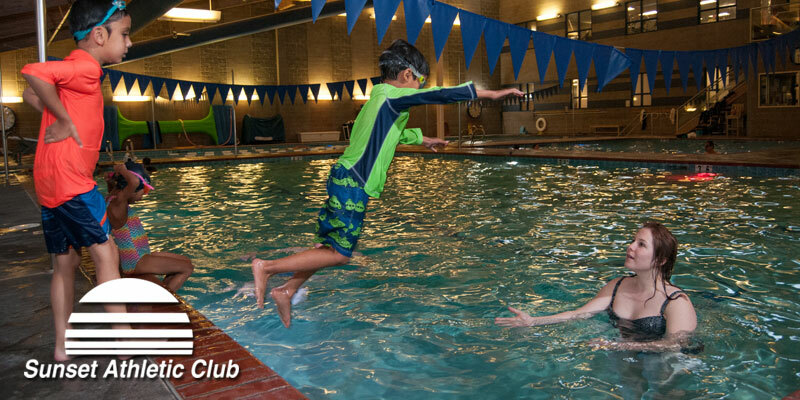 Upon successful completion of the Guppies Class, the child will be eligible for our regular group swim lessons. Guppies follow the group swim lesson procedures for evaluations and registration. Come play with us in our warm-water therapy pool! Each child MUST be accompanied by an adult in the pool, and wear a swim diaper. Registration forms for these and other Indoor Aquatics programs are available on the Activity Wall. Non-members must submit payment with registration. This aquatic program designed for ages 7-12 years is designed to improve stroke technique while swimming laps. It's a great way to improve skills and/or practice and train for Swim Team competition. Prerequisites to participate include: Swim 50 yards freestyle (with side breathing); Swim 50 yards backstroke; Swim 25 yards coordinated breaststroke; Demonstrated butterfly, and a standing front dive. New participants must have instructor approval to enroll. Sessions run seasonally, usually held on weekday nights and Saturday mornings. We offer a variety of workshops designed to improve your overall swimming skills as well as introduce you to several enjoyable aquatics activities. Workshops are generally for ages 7+ and include topics such as: Diving, Freestyle, Butterfly, Breaststroke and other swim techniques. Our staff is always adding fun events to the Aquatics schedule. Events are often seasonally-themed, such as our Polar Bear Swim Camp, and our Underwater Easter Egg Hunt. Some events run for weeks, such as our Water Fitness: Conquer the Columbia or our Holiday Presence programs. Camps are often for children ages 7+ and are scheduled around local school “off days”. Camps have themes like “Diving Dolphins” and “Boats and Floats” or "Spring Break Mini Camp".